Billy Bob is deaf and had been punished for his deafness before coming to Dogs Trust, and was very scared and unsociable. Dogs Trust have done such a fantastic job with him and he’s now a happy, excited, beautifully trained and VERY WAGGY boy just looking for the right home. Being a Welsh shelter, Bridgend also contains plenty of collie goodness – watch to the end of that video for a faceful of Smithy the collie! Dogs Trust are looking for a home for beautiful Lily and her devoted ‘guide dog’, Maddison. 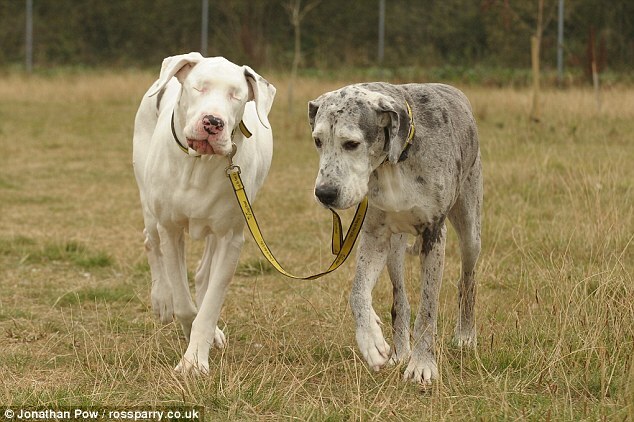 Being two Great Danes, one of whom is blind, who need to be rehomed together, they’ve been having a spot of trouble finding a home. There’s been lots of interest in them since this article was posted, and Dogs Trust actually announced that they’d been rehomed, but then it fell through. These two are lucky to be alive. They’ve been at Dogs Trust since July. Some shelters would have destroyed such hard-to-rehome dogs by now – or destroyed Lily alone. Dogs Trust never does that to a healthy dog (and despite her disability, Lily is healthy, happy, and runs around like any other dog.) Right now it’s looking really hopeful that she and Maddison will find a family, but if they don’t, they’ve got a loving home at Dogs Trust for life. And this is why I’m posting this in the ‘Why Dogs Trust’ category. In other news, I’ve been sleeping with my origami paper under my pillow. I am a dork.